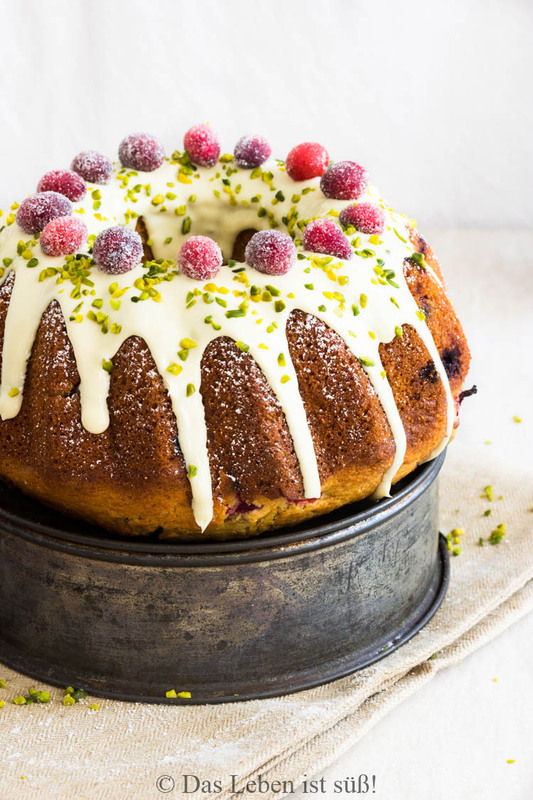 Cranberry-Buttermilch Guglhupf - DAS LEBEN IST SÜSS! I have to admit, most of my life I neglected Bundt cakes. I always found them to be a bit too dry for my taste. 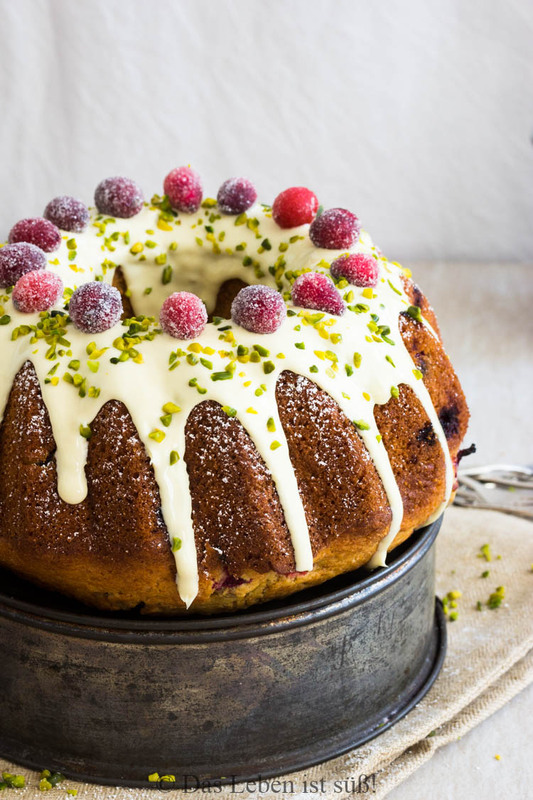 But they do look very pretty with some decorations and toppings and after experimenting a bit I am now presenting you already the second Bundt cake recipe within a couple of weeks. 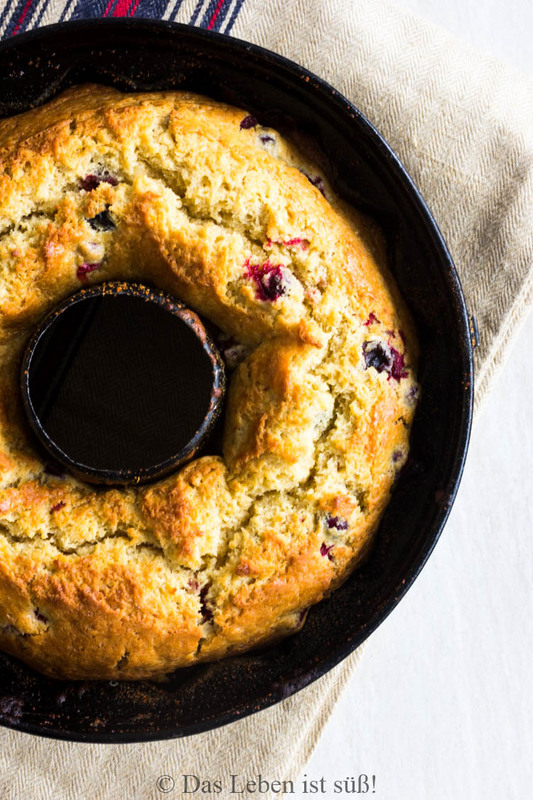 Made with buttermilk for a lighter texture and topped with sugared cranberries for the wow-effect. No understatement today, doesn´t this cake look lovely? This recipe was an entirely spontaneous endeavor. It almost didn´t happen at all because it is kind of difficult to get fresh cranberries this time around. However, I did manage to find some at the local market, thankfully. 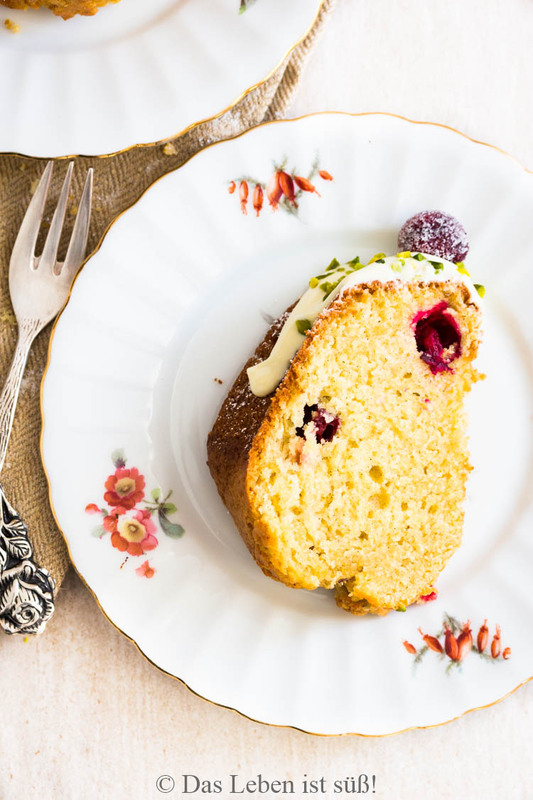 Of course, this recipe works without cranberries as well but the main reason I wanted some was that I have seen a couple of gorgeous cakes that were decorated with sugared cranberries and I really wanted to try that. So I googled a bit, found a recipe and gave it a try. Cranberries have a rather sour and tart taste and are usually in season during fall. According to the internet, you can get fresh cranberries until the end of January, at least in Germany. I´m not familiar with other countries but I would imagine that it´s similar. 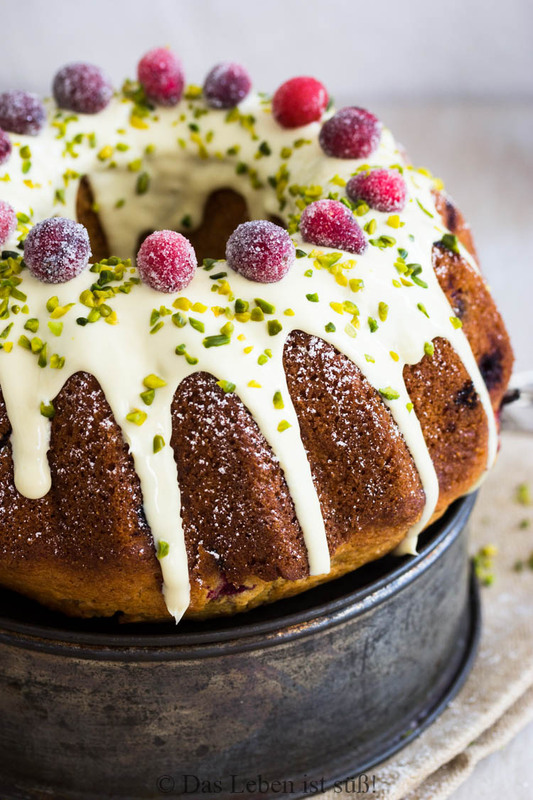 If you can´t get fresh cranberries you can just leave them out, which would make for a simple vanilla-buttermilk cake that can be jazzed up with toppings and decoration. During the summertime I would imagine that other berries work just as well, cherries or blueberries come to mind. If you want to go for a fresher taste, you could substitute vanilla for 1 tbsp. of lemon zest. 1) Preheat the oven to 175°C. Butter the cake form and sprinkle with flour or breadcrumbs. Wash the cranberries. 2) Beat butter with sugar and the core of the vanilla bean or vanilla extract. Add eggs and mix well. 3) In a separate bowl, mix flour, baking powder, salt and corn starch. Carefully fold the flour mixture, together with the buttermilk, into the egg-mixture. Mix cranberries with 1 tbsp. of flour and add to the batter. 4) Pour the batter into the cake form and bake the cake for about 35-40 minutes until it has risen and is golden brown. Take out of the oven and let cool for at least about 10-15 minutes before turning the cake form and taking out the cake. Decorate with white chocolate, chopped cranberries and sugared cranberries (recipe here).